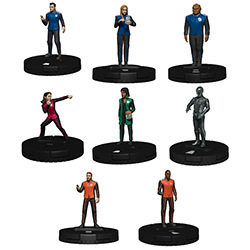 The Orville HeroClix: 2-Player Starter Set features eight of the most prominent crew members from the Orville: Captain Ed Mercer, Commander Kelly Grayson, Second Officer Bortus, Chief Medical Officer Claire Finn, Chief of Security Alara Kitan, Isaac, Lieutenant Gordon Malloy, and Chief Engineer John LaMarr. Each Starter Set also includes everything players need to learn and start playing HeroClix including the HeroClix Rulebook, a double-sided Map, a Powers and Abilities Card (PAC), Object Tokens, Terrain Tokens, Dice, and Character Cards. Scheduled for release in September 2019, each 2-Player Starter Set will have a $34.99 MSRP.